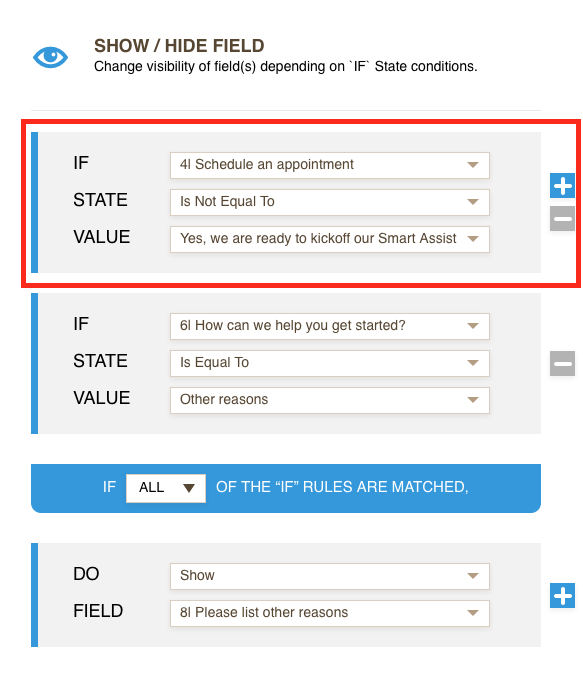 One of My Fields Doesn't Follow the Show/Hide Condition Rule? Issue is that when conditions are set to select "No...", the three fields show with third option as "Other". When "Other" is selected a hidden text field for 'Please list other reasons' is set to Show, which works as expected. However, when once "No..." is selected after selecting "Yes...", followed by the Other, then if one switches back to "Yes..., everything else hides, but the text field for 'Please list other reasons' remains visible. It should technically hide too. So, in that case, I tried setting the hide 'Please list other reasons' text field to hide upon selection of 'Yes...' and it remains showing from default. It should only show when 'Other' is clicked which should show when 'No...' is selected. I checked your conditions and you have done everything as it should be and also I replicated the same result with you when the necessary steps are taken. To beat this issue you need add a following if state to your current condition related with the field called "Please list other reasons". Awesome!!! It works now! Thank you ever so much!! You are most welcome. If you have other questions about "Conditions" in the future, please do let us know. We will be happy to help you.